I think just about everyone, religious or not, knows the story of Adam and Eve and the forbidden fruit. Most people know of the forbidden fruit as an apple. I’m not sure where I read it but I’ve heard that it might have been a pomegranate. Has anyone heard anything similar? When I took this photo JJ said why don’t you pick one from the tree. It wasn’t the story of Adam and Eve that stopped me, but the fact that it was taking someone elses fruit although it was hanging over the footpath and that means it’s anyone’s doesn’t it? I kind of wish I had taken one now because it’s been too many years since I ate a pomegranate. They wouldn’t have missed one of these surely. Those are beautiful. I have never seen one on a tree, only at the grocery store. It would have been hard not to pick just one. 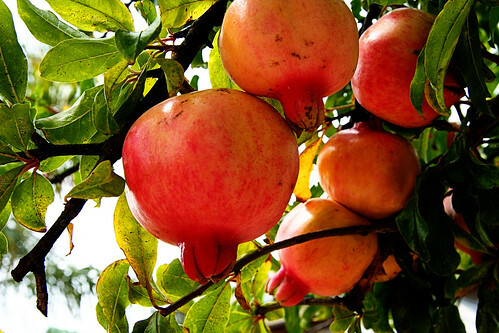 They are gorgeous – I have never eaten a pomegranate, what are they like? I agree, it is a grey area with the morality of picking fruit from the footpath. Toni, I’m really tempted to back and go for it. Jeanie, it’s been a very long time since I ate one, and I remember the seeds being pain to get rid of and/or eat, but I do remember liking them. Perhaps we’ll go for another walk and just take one! I remember school friends eating them (many, many, many years ago). 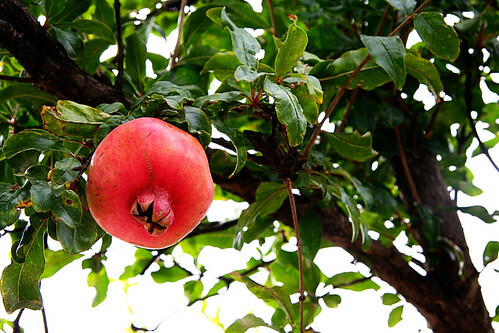 I have heard that it was a pomegranite not an apple that is the forbidden fruit, too. M&B I’m glad I’m not alone with the pomegranate in the garden story. Oh my. I LOVE pomegranates and have not had one for around 20 years, I think. I would have succumbed to temptation, I am afraid.